You all know that bloggers are offered lots of products and books to review. I think I ignore about 85 percent of the offers that come my way, for one reason or another, selecting only the ones I find most interesting, or I think would be interesting to readers. I don't get paid to do them, and they take a fair bit of time to do them well. I was about to turn down a recent offer when I stopped to think about it. It was chocolate — organic, gluten-free, vegan chocolate from Sweet Designs Chocolatier. And, I wasn't even asked to write a review — just to try the chocolate. What would you do? I received three samples — a 17-piece dark chocolate assortment, and two four ounce containers of 70% dark chocolate bark. 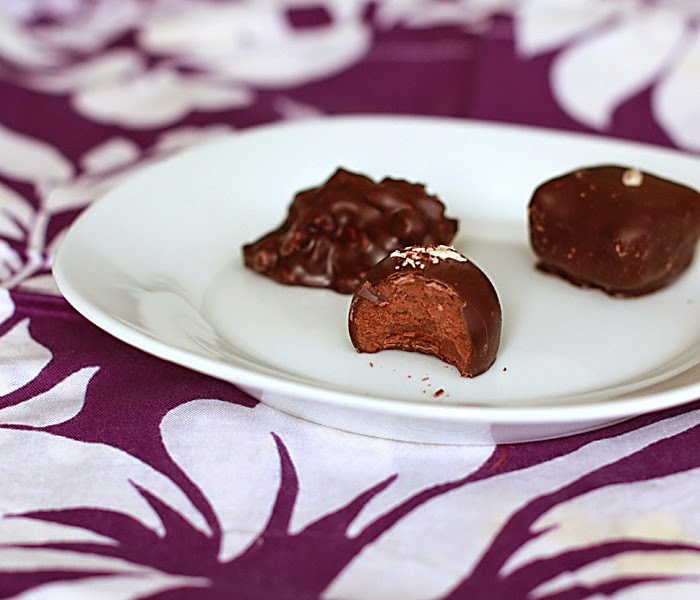 The assortment contained chocolate truffles, coconut truffles, coconut clusters, date power squares, molded almonds and more. A gift box like this would make a great impression on your favorite vegan, and, you know, Valentine's Day is fast approaching. I was quite taken aback by the variety and beauty of the pieces, and the creamy smoothness of the fillings. I've very much enjoyed sampling the delicious chocolates in the assortment, especially the chocolate truffles, but my favorite sample is definitely the puffed quinoa bark. Woof! To be perfectly honest, while I love to gaze upon such a beautiful assortment, I prefer my dark chocolate relatively unadorned. 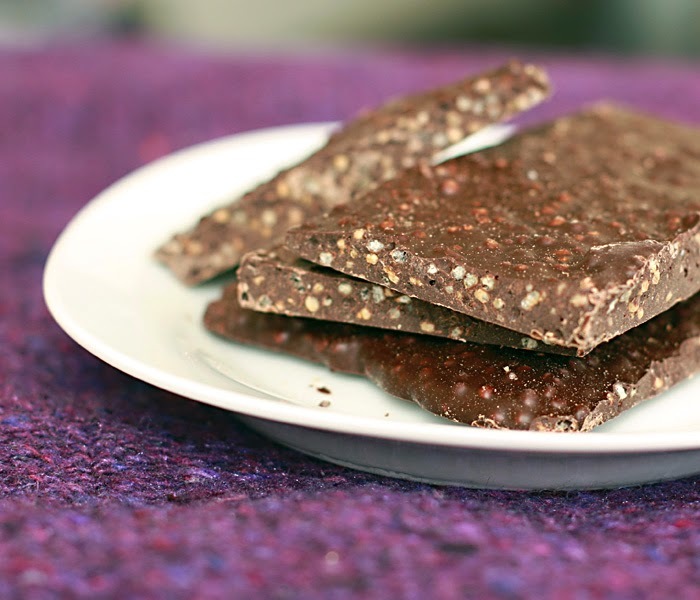 The puffed quinoa adds the perfect amount of crunch to the 70% dark chocolate. 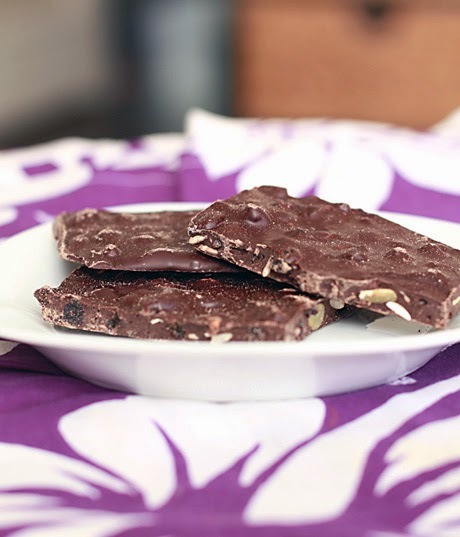 It complements without competing, and the rich, smooth, dark chocolate flavor is the star. I could easily become addicted to it. I think I will share all of the varieties but this one. It's mine. I also received a packet of 70% dark chocolate trail mix bark. The trail mix contains zante currants, pumpkin seeds, sunflower seeds and cacao nibs. For me, the sweet taste of the currants interferes with the bitter taste of the chocolate, though I suspect most people would disagree with me, and find it complementary. Sweet Designs Chocolatier, from Lakewood Ohio, is not an all-vegan company, but their 70% organic dark chocolate varieties are vegan. The soy lecithin used in the chocolates is non-GMO. I don't know if their chocolate is fair trade. 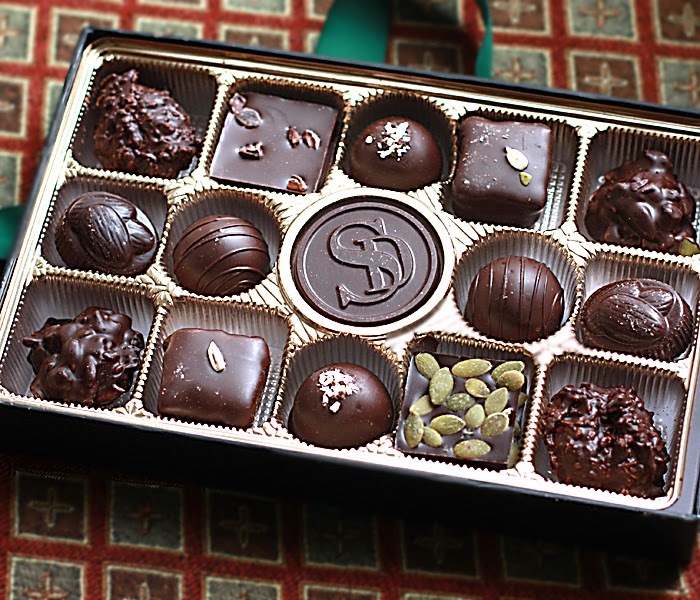 Have you ever tried Sweet Designs chocolates? Disclaimer: I received the chocolates for free. I wasn't asked to review them. All opinions are my own. Everything in our refrigerator has been frozen since Saturday. I don't mean in our freezer — everything on the REFRIGERATOR shelves is frozen — jars of olives, miso, sundried tomatoes, kimchi, soup stock. The stuff in the drawers and door shelves is extremely cold, but not quite frozen. We've already gotten rid of the frozen salad greens and ruined bok choy, and managed to use the frozen kale, but I'm still waiting to see what will become of the olives. It's so hard to dump a giant jar of kalamata olives under any circumstances. And what about the coconut milk? Anyone have experience with frozen cans of coconut milk? Did you know if you pop a box of frozen (formerly fresh) mushrooms into a pot of soup they taste perfectly normal after they are cooked? Frozen tofu, of course, has a nice chewy texture after being defrosted and cooked, and peppers can also be frozen whole then cut and added to dishes. I had no idea it was so hard to get an appliance repair person to come out to the house, and it's just not possible to bring a fridge in for service, hahaha. The first person we called refused to come at all. The second one said he'd come Friday or next Monday, and the third agreed to come this past Monday. Of course he had to order a part which didn't come until last night, so I'm still waiting for him to return today. It's already long past the time he said he'd call, but oh well. It's weird not having a working refrigerator, though the worst thing is probably the inconvenience and waste of having to replace all the staples we keep on the shelves. One plus was we had to remove everything from the freezer so the repair guy could troubleshoot, and now it's all organized and clean — and we know what's in there! 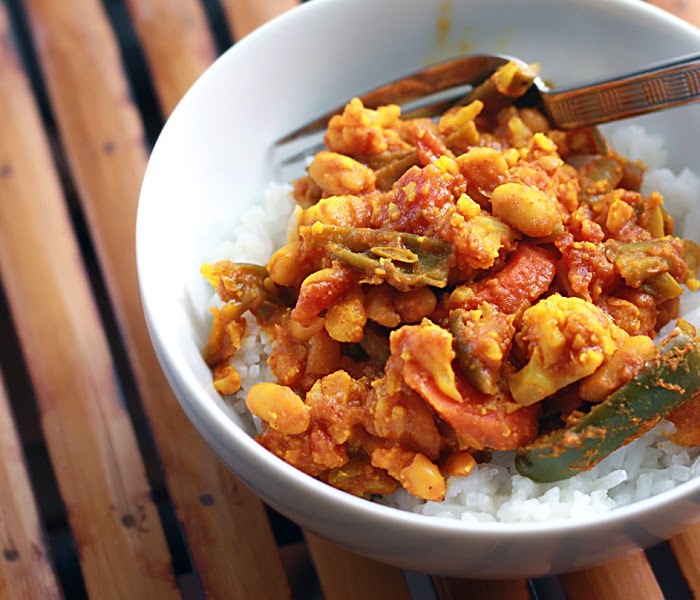 Anyway, we weren't much in the mood for cooking last night until I happened to watch a video on Vegan Lovli's blog showing how she and her partner made butter bean curry in 30 minutes. It was a wonderful video that got me in the mood for making curry. Actually, it got me in the mood to show my husband the video and convince him to make it. I really liked the 30-minute aspect as well, though it took a bit longer at our house. 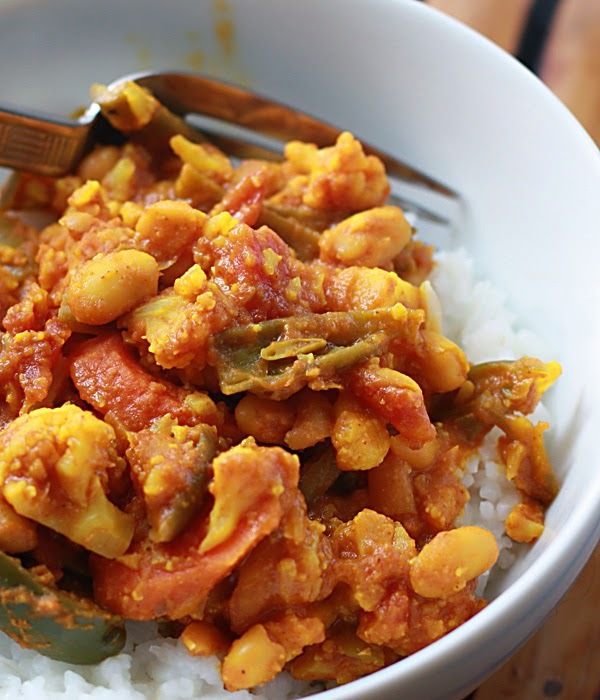 We had the butter beans (lima beans, actually) and a couple of very cold veggies still unfrozen in the vegetable drawer — not to mention a frozen pepper — so he made a nice curry for supper. You should, too! Vegan Lovli's photos are much better than mine, and her video tutorial is wonderful, so go on over and be inspired! I suspect when most people think of oats they imagine a bowl of steaming oatmeal, a few oatmeal cookies or maybe a muffin. 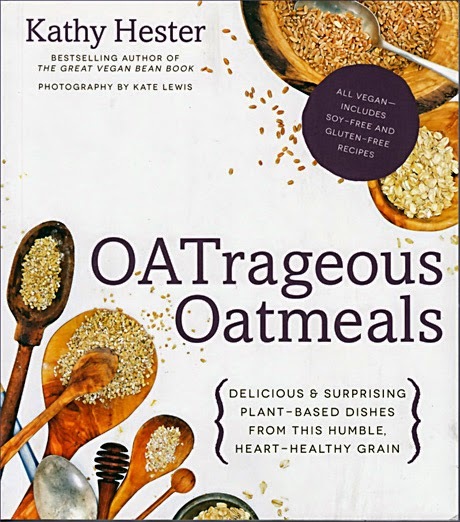 When Kathy Hester, author of OATrageous Oatmeals, thinks of oats, she conjures up an entire cuisine. The book contains a mind-boggling assortment of oatmeal creations from DIY staples, to fantastic breakfasts, to soups, stews and other savories, to desserts, to drinks, to body care to dog biscuits. I never realized there were so many things you could make with oats. I admit when I first saw the cookbook, I was skeptical about making anything beyond my familiar oatmeal repertoire of breakfasts and desserts, but the photos and descriptions were so intriguing they inspired me to get more creative. 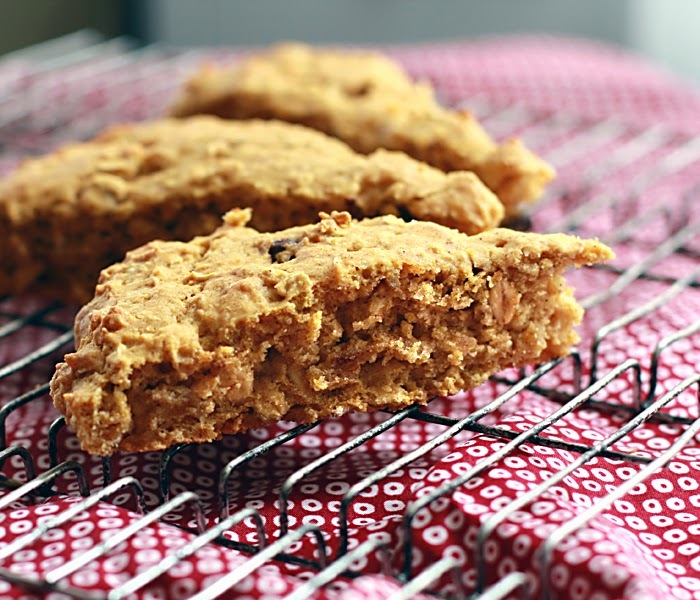 I started with the familiar, though, and made a batch of butternut squash maple walnut scones, which were surprisingly flaky and delicious, considering they have no added oil. I made them with Bob's Red Mill Gluten-Free Baking Mix, and had to adjust the recipe a bit to get the right balance of wet to dry, but was very happy with the end result. 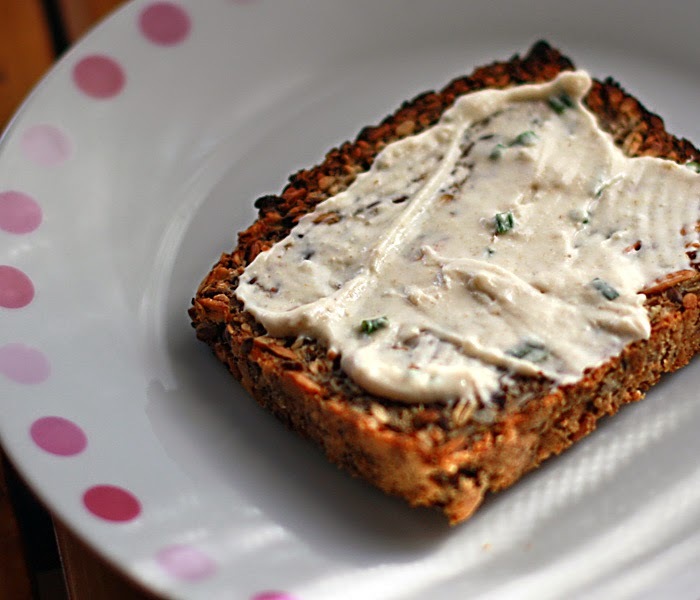 Next I tried the recipe for creamy cashew-oat cream cheese. 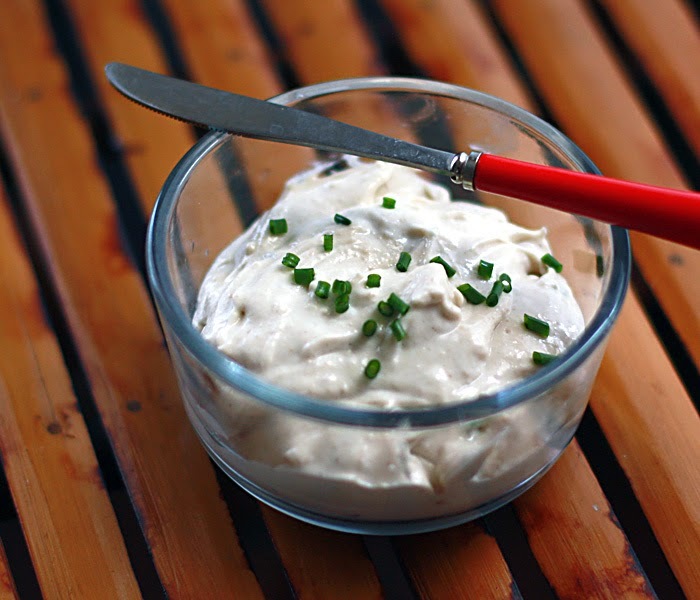 I've made a number of plant-based cream cheese recipes in the past, and was curious to see how this one would compare. Tastewise, it was spot on for rich, cream cheese flavor, but I thought the texture was bordering on odd, with a slightly gluey feel. On the plus side, it didn't need to be fermented like my favorite cream cheese recipe, to develop the flavor. It made a nice spread for an unusual GF nut and seed bread I had just baked, but I don't think it will replace my other recipe, because of the texture. Pretty good, though. 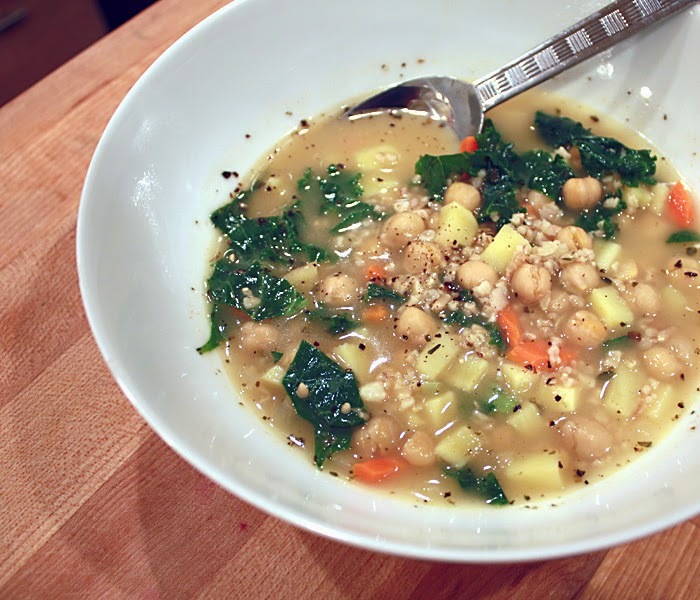 Making soup with steel cut oats wasn't something I'd previously ever considered, but the chickpea veggie soup looked and sounded so good, I couldn't resist. The oats gave the soup a nice texture and body, and the flavor was excellent. This is definitely a recipe I would turn to again. There has been so much negative publicity recently about arsenic in rice, and warnings to limit the amount of rice consumed, that it's nice to find another grain to add to my repertoire. Thanks to Kathy Hester for such creative use of oats! 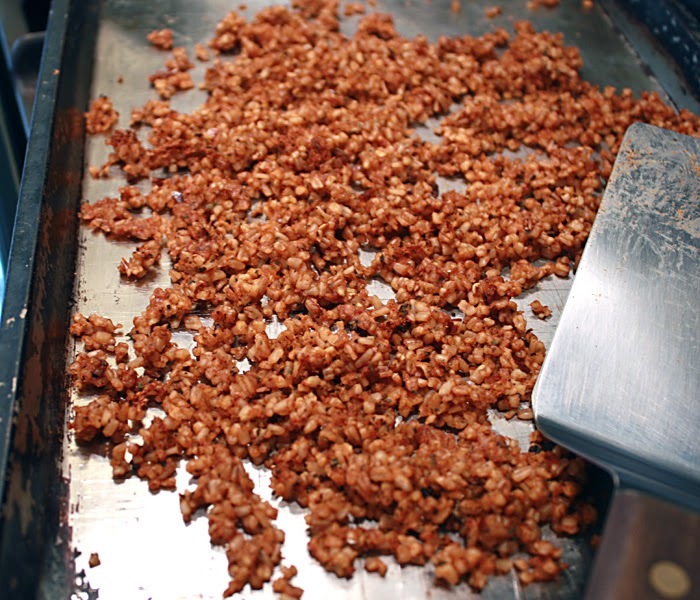 Truthfully, I've been vegan for so long that I can't really remember what pepperoni tastes like — nor did I eat much pepperoni before I was vegan, so I may not be the best judge of whether the pepperoni crumbles tastes like its namesake. But, I couldn't resist making a plant-based meat from steel-cut oats. The final result was, "interesting" as my husband said, and was a good addition to the biscuits and gravy that I'll tell you about soon. I rarely buy "fake" meat — I don't crave it, and usually don't like the ingredients list — so if I want a meat-like food for a recipe, I'd much rather use something like this. It was tasty and chewy, and it makes me want to do some additional experimenting subbing oats for wheat in certain plant-based recipes I used to make in the very distant past. I had a problem with the recipe instructions, and asked my husband for his interpretation of the directions, which was the same as mine. 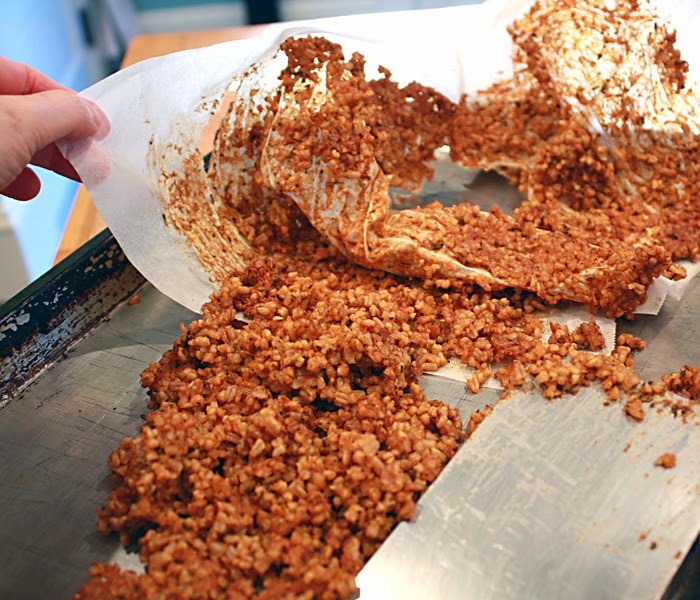 I guess I didn't make the right choice in how to proceed because I ended up with a messy situation involving scraping the crumbles off shredding parchment paper. I'm sure I won't be the only person making this mistake. In the end, I rescued most of the crumbles, and they turned out OK, but it wasn't a straightforward procedure. I have a confession to make. I've never had biscuits and gravy. I never thought much about it until fairly recently, though I realize it's long been a classic food in the South. 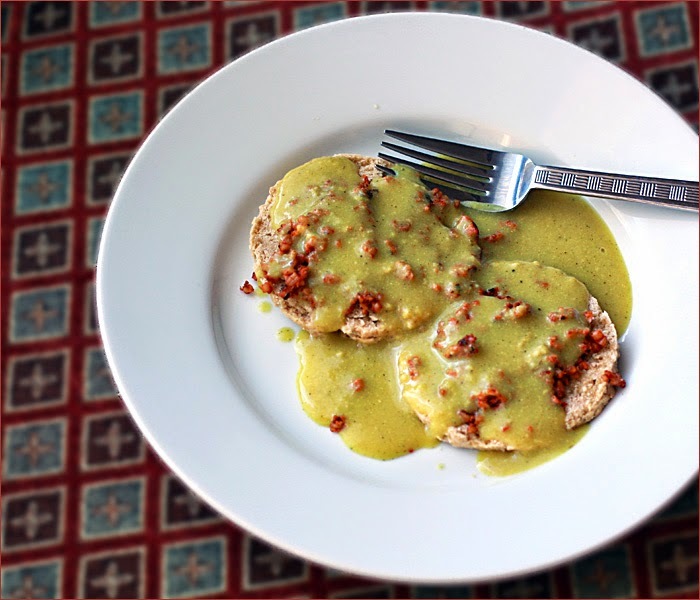 Since it's so popular now for plant-based eaters to veganize traditional meat and dairy-based foods, and since there are so many blogs, cookbooks and vegan restaurants specializing in 'comfort foods,' biscuits and gravy finally creeped onto my radar. Seeing that OATrageous Oats contained all the recipes I would need to create my first plate of biscuits and gravy, I figured, "why not?" 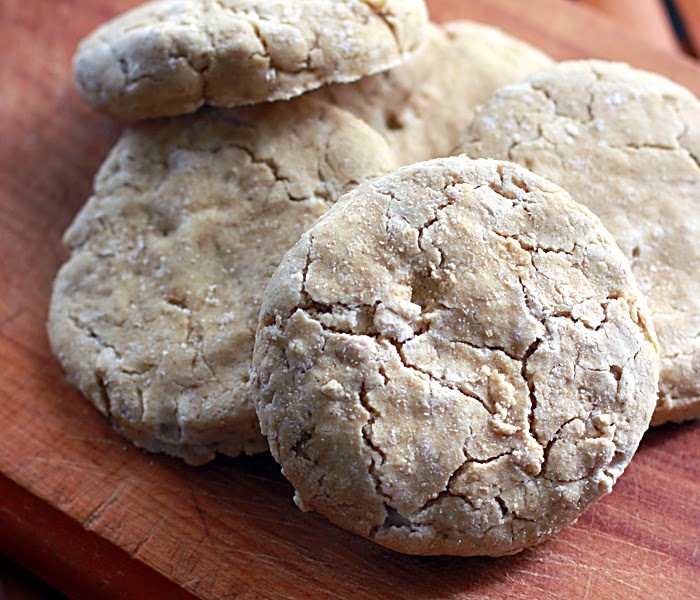 First came the Southern-style biscuits. I followed the directions to substitute GF flour for the wheat flour, and although I measured carefully, my batter was much too wet to use as directed. I had to add a lot more flour to get a manageable dough. Next, I followed the directions that the biscuits should be finished baking when the bottoms were brown. The bottoms of my biscuits never turned brown, and I finally removed them from the oven fearing they would dry out before they darkened. I'm assuming my problems are related to the GF option I used, though the directions said to substitute GF flour in the same proportions. 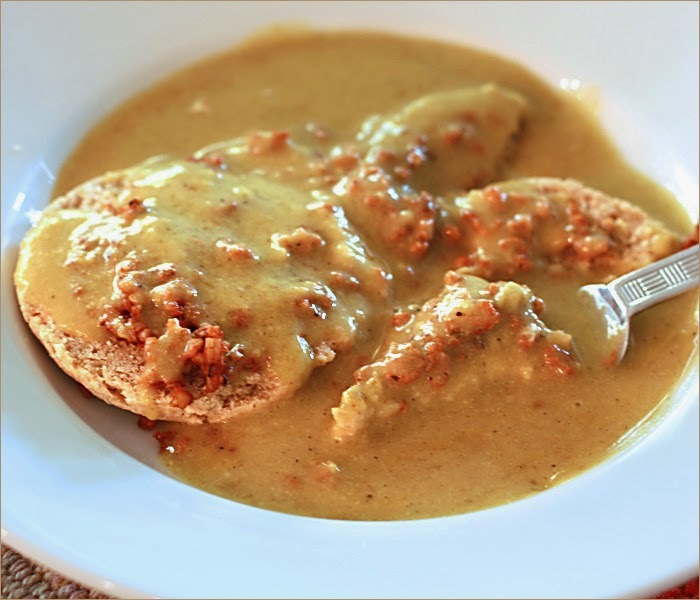 Once I had my biscuits and pepperoni (there is also a recipe for sausage crumbles, if you'd prefer), I made a batch of DIY golden gravy mix. The mix is added to boiling water and cooked for five to 10 minutes — mine took at least 10). According to the recipe, 1-1/2 cups of water plus 1/4 cup of mix is one serving, though I used half that amount and it looked like a lot for me to eat. 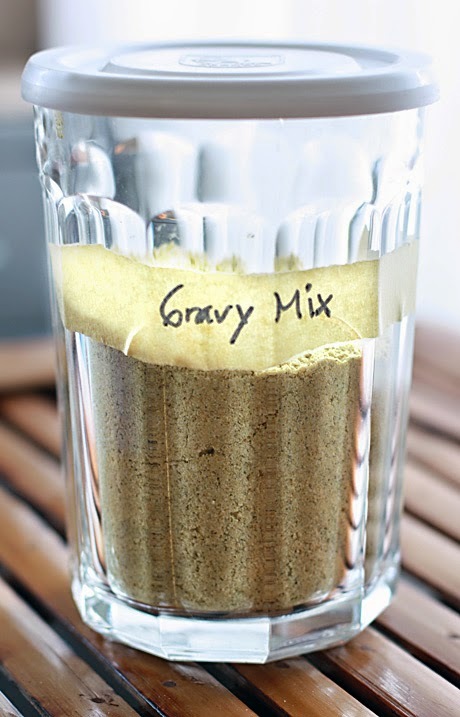 The gravy was tasty, but I think next time I make it I'll use soup stock and maybe add some mushroom powder. Once I had all the pieces, I put together my first plate of biscuits and gravy with pepperoni crumbles subbing for sausage crumbles. The gravy was a little greener than I'd expected, and there seemed to be so much of it that I only used about half of what I'd made. I found my first few bites underwhelming. But then it started to grow on me, and I had an idea. I poured the rest of the gravy onto my plate and dug in with gusto. Not too bad! I found myself gobbling it up. I'm going to make some for my husband tonight, partly to see what he thinks, and partly because I want more. I've only touched the surface of the recipes available in OATrageous Oats. Although I do think there are some problems with recipe directions and GF conversions, overall the book is one of the most unique vegan cookbooks you will see. It opens up new possibilities for using a healthy whole grain that's been the victim of overlooked potential. The breakfasts, dinner dishes, desserts, etc. are so creative and gorgeous, you can't help but be inspired to try them. There are so many great ideas — for example, since reading through the book, I've been adding raw oats to my morning smoothie, finding it satisfies my appetite for hours. Not only is the book bursting with creative recipes (pumpkin coffeecake oatmeal, hummingbird cake oatmeal, chocolate hazelnut granola, mushroom ginger congee, oat, gnocchi, eggplant pizza sliders, oat dosa, Indian oats upma, oat-chata, oatmeal cookie scrub, etc. ), it contains wonderful photography by Kate Lewis. AND, the book lies flat when open!